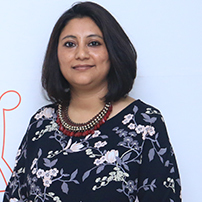 Sangeeta is a communication and marketing specialist with more than 15 years of experience in the field of branding, communication, digital media, campaigns and training delivery. She has extensive experience of working in a cross-cultural global environment. Before joining CAF India, Sangeeta managed several communication assignments mostly for the countries in the Middle East and Africa. She is a commerce graduate with diploma in software engineering. Sangeeta holds a certificate in international communications from Chartered Institute of Marketing, United Kingdom. Under her leadership, the CAF India brand has been successfully positioned as a trusted name in the sector and has created a remarkable brand recall amongst its stakeholders that is donors, corporates and NGOs partners. She has put in place a dynamic team to focus on future prospects of effective marketing of the CAF India brand via digital, offline, media and partnership space to help further grow the organisation’s philanthropy portfolio and market presence in India. Her skills include a wide range of integrated CSR-marketing approaches and initiatives, effective communication tools focused on organisational development and management. When South Sudan became a new country, Sangeeta facilitated to launch the UK Foreign Office’s digital presence. She received the ‘Above and Beyond the Call of Duty’ award from FCO for successfully managing the South Sudan digital presence launch project. She worked on various ministerial visit integrated campaigns – Prime Minister David Cameroon, Foreign Secretary William Hague, Alistair Burt and other ministerial visits to Middle East, Africa and Central Asia. Worked in the pioneering digital evaluation process – an annual health check which is now implemented globally to evaluate the web presence of over 240 British Embassy websites across the world.